Say farewell to PMS, irregular periods, headaches, and more with these 17 tips to balance your hormones naturally! Includes recommendations for foods, supplements, exercise, stress management, gut health, and more. Hormone imbalance is becoming more prevalent and it can happen for a variety of reasons. 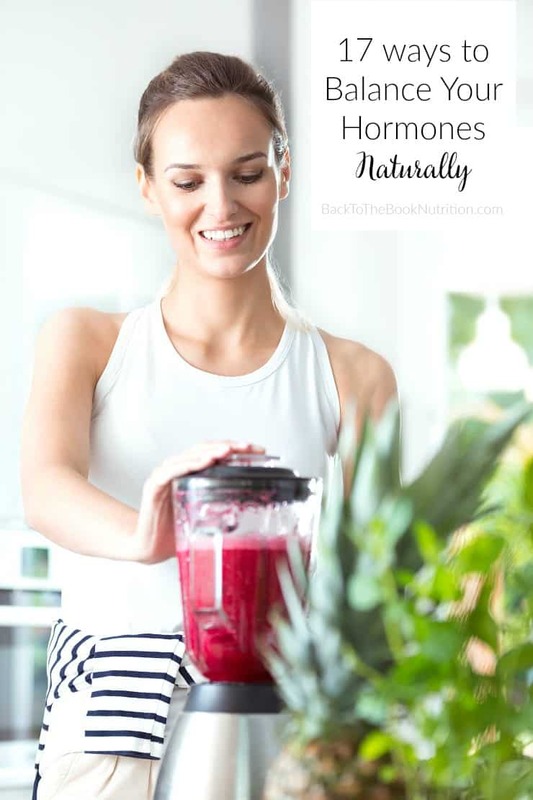 If you have irregular periods or other symptoms of hormone imbalance, these basic steps will provide a solid foundation to help restore hormone balance and promote healthy, normal periods. Cruciferous vegetables – sometimes called Brassica vegetables – are high in fiber as well as diendolylmethane (DIM), a compound which can help the body detoxify both estrogen and testosterone to prevent them from building up in the system. The fiber also helps keep the bowels moving, another way the body rids itself of excess hormones. Diindolylmethane (DIM) supplements can also be very helpful in cases of significant estrogen excess (i.e., PMS, endometriosis, fibroids, etc.) or androgen excess (i.e., PCOS). Ask your provider whether DIM is right for you. We all know that wild caught salmon and other fish and seafood are preferred sources of omega-3 fats in our diets. These healthy fats help lower inflammation, which can help reduce cramps. Fish and seafood also provide iodine, which helps to both detoxify (reduce) estrogen in those with PMS, endometriosis, fibroids, etc., can reduce cramps and breast pain, and can help promote ovulation in women with PCOS, infertility, and other conditions related to inconsistent or nonexistent ovulation (Source). I advise at least 2 servings of fish/seafood per week (4-6 oz each). Whether you buy fresh, frozen, or canned, just get it in! Remember, fish/seafood you get at restaurants is almost certainly farm raised – so that doesn’t count toward your weekly wild caught goal. If you just can’t consistently eat enough wild caught fish/seafood, consider taking cod liver oil or a high quality fish oil supplement. Discuss iodine supplementation with your provider before taking since there are some cases when it might be discouraged. Red meat sometimes gets a bad rap but, high quality meats from local farmers who raise animals on pasture are actually a gold mine of nutrition. Pasture raised red meat is an excellent source of iron, zinc, and B vitamins – all nutrients that are important for hormone health. If you have heavy bleeding, thinning hair, sluggish thyroid, fatigue, PMS, or digestive issues, make sure you’re getting a couple of servings -(4-6 oz each) of high quality red meat weekly. Slow cooker beef roast and pulled pork are great options! Note that iron overload has been linked to endometriosis. Having your ferritin levels checked is a good way to rule out iron overload and help determine how much iron rich high quality red meat you should eat. Your doctor can order ferritin, or you can request it yourself for around $30 from companies like Direct Labs. Personally, I’m a big fan of dairy in just about any form – butter, yogurt, cheese, milk, and – yes – even the occasional whipped cream and ice cream. But, if you’re dealing with PMS, heavy periods, acne, or other signs of excess estrogen, the extra hormones coming from dairy in your diet (even organic dairy – remember it’s still breast milk!) could be adding insult to injury. You may try omitting dairy for 3 months to monitor what affects it has on your cycle. 6. To Drink or Not to Drink? There is a bit of controversy in the scientific literature about whether alcohol is beneficial or detrimental for hormone health. On the one hand, we know that the resveratrol in red wine (but not in white) can help lower testosterone and boost estrogen levels in women with PCOS. For those who don’t enjoy red wine, taking 1,500 mg of a resveratrol supplement daily can have similar results. Red wine may help lower estrogen in some cases too. One small clinical trial showed that daily red wine consumption for one month helped lower estrogen levels in women. White wine didn’t cause the same effect. On the flip side, earlier studies clearly link alcohol consumption to higher estrogen levels and higher rates of breast cancer. My general recommendation is to limit alcohol to no more than 1-2 drinks per week, with a preference for red wine over other forms. Mangesium helps with muscle relaxation, which can improve muscle cramps, sleep, headaches, and period pain. Most of us don’t get enough magnesium in our diets – both because we skimp on high magnesium foods, and because of mineral depletion of our soils and other environmental factors out of our control. I usually encourage both eating higher magensium foods and supplementing. Plastics and plastic-like products have estrogen-like effects in our bodies. This isn’t just limited to BPA. It includes dioxins, phthalates, lead, and many others that are found nearly everywhere these days – clothing, makeup and personal care products, building materials, and even our water supply! EWG has compiled a “Dirty Dozen” list of the most harmful endocrine disruptors and how to avoid them. It is nearly impossible to live under chronic stress without suffering some degree of hormone imbalance. Our bodies were designed to prioritize responding to stressful events over things like reproduction. This is wonderful if you’re being chased by a lion but can be problematic if your body perceives your fast paced, high pressure, technology-saturated daily life as a source of constant stress and ends up perpetually stealing resources from your hormone production efforts. Learn more and get more stress management tools here. Monthly hormonal shifts can affect our blood sugar, which can make us more moody and increase cravings. In turn, chronically low or high blood sugars can lead to hormone imbalance. In fact, some hormone related conditions like PCOS are strongly linked to blood sugar imbalance and insulin resistance. When these steps aren’t enough, additional measures like intermittent fasting or supplements that help control blood sugar (i.e., chromium, myo-inositol) may be beneficial. Sleep makes everything better, and hormone health is no exception. When our bodies are chronically sleep deprived (less than 7 hours per night every night, or less than 6 hours per night many nights), our stress hormones surge and our reproductive hormones suffer. I recommend at least 8 hours of uninterrupted sleep per night with at least one morning per week where you sleep in until you wake naturally without an alarm. Is sleep a struggle for you? Take my 5-question Sleep Quality Quiz, and get my top tips for how to sleep better naturally! Our bodies were designed to move and research shows that physically active individuals have better energy levels, mood, sleep, weight, hormone balance, gut health, and more! So pick an activity you enjoy and get moving.If you need a few ideas, here are a few of my favorite at-home workouts! Just remember that too much exercise is actually a significant stress on the body. Choose exercises you enjoy and do them at an intensity that challenges you, but doesn’t completely exhaust you. If it takes more than 30-60 minutes to recover your energy after a work out, you may be overdoing it. If you’re dealing with HPA-axis dysfunction (aka: adrenal fatigue), chronic fatigue syndrome, or similar conditions, gentle exercises like stretching and short walks may be best until your health is restored. The liver is the primary organ responsible for detoxifying the body. This includes everything from alcohol to medications to harmful chemicals to hormones. There are two main phases of liver detox: Phase I, where substances are essentially packaged for processing (imagine a company packaging up their product for shipping); and Phase II, where they are actually processed and ready for removal (now those packaged products are being loaded onto the truck for shipping). Continuing the shipping analogy used for the liver’s role in detoxification, the gut acts as the shipping truck that actually delivers the “packages” out of the body. For this reason, the elimination via the gut has recently been called “Phase III Detox”. So it makes sense that, when stool stalls out in the gut, some of those hormone byproducts that have been packaged for removal can be re-absorbed and sent back into circulation, increasing hormone levels. This is why it’s critical that you keep your bowels moving and avoid chronic constipation at all costs! Imbalances of “good” and “bad” bacteria in the gut can also disrupt hormone balance. For example, high levels of “bad” bacteria in the gut can increase beta-glucuronidase, which reactivates estrogen byproducts and makes them more easily re-absorbed back into circulation. The result is higher estrogen levels and signs of estrogen excess like PMS, cramps, headaches, heavy menstrual flow, endometriosis, and fibroids. If you have gut symptoms like heartburn, bloating, gas, pain, constipation, loose or urgent stools, floating stools, or other GI symptoms, it may be helpful to get a comprehensive stool test to find out what underlying gut issues could be fueling your hormone imbalance. I offer this type of testing in my Holistic Nutrition Coaching services. These are some of my favorite supplements for women’s health in general, and period healthy specifically. Not everyone needs these, but they can be very helpful in many cases of hormone imbalance and irregular periods. Discuss with your provider before taking. Of course, I always advocate for tracking your basal body temperatures and other factors like cervical mucus to help you identify any specific hormonal imbalances. Work with a holistic practitioner like myself to help you interpret your monthly cycle patterns. Note that if you’re on hormonal birth control, there’s no need to track your menstrual cycles. Hormonal birth control – especially the pill – is conventional medicine’s answer to almost any type of hormone imbalance. But it’s important to know that hormonal birth control does NOT balance hormones. It suppresses them. This may be an effective way to quiet the symptoms of hormone imbalance, but definitely isn’t a real solution to the root cause. In fact, taking birth control can make hormone imbalance worse in the long run. It also increases risk for depression, gut dysfunction, nutrient deficiencies, and some cancers. I advise steering clear of hormonal birth control altogether if possible. Other medications like corticosteroids and statins can also interfere with hormone production and/or balance, so be sure to discuss those concerns with your prescribing physician if you are taking or considering taking those medications. The big take-away here is eat real food, be active, slow down, get good sleep, and listen to your body. These are all simple concepts, but they aren’t always easy to do in today’s world. Still, to the degree to which you can consistently implement these, your hormone health and overall health will benefit. As always, if you want a personalized plan to optimize your hormones, or are interested in functional medicine testing for hormone imbalance, I’d love to help! Thanks again, you have brilliant tips on this website. I am looking in to eating more healthily to help out with hormones. You’re welcome, Sarah. I hope you find lots of practical tips to help you in your journey! Definitely ditching the dairy and adding magnesium are the things that have worked best for me – very valid advice. That’s great, Caitlin. Thanks so much for sharing your experience! Great suggestions, even just making a couple of these changes will impact how you feel. I’m not sure I could do all 17, altho that would be the goal. What great a great list! I have been looking at ways to get off birth control (on it to manage estrogen) and I feel like these tips would help me! That’s great, Amanda – blessings to you! Great tips!! I was happy to see that I am already doing some of these naturally! Now to work on stress, sleep, and working out! haha! The number 1 rule is always eat real food instead of process food or can food but process food and can food can be taster. No matter what stick with the real food and be active and good night sleep. Be happy and feel gratitude all the time. Those are wise words – thank you for sharing! These are some really great tips. You’ll find you gain a lot of other benefits too from practicing these! This is such a nice post, very interesting and informative. I am sure that these things are great help to all girls who are facing this kind of problem. I will also share this with my friends. That’s great, Gerline – I hope it helps them! The foods are so tempting and looks delicious. You are very creative in terms of cooking. Thank you for inspiring me. will try to cook some of these. Wow! There is so much information. And it sounds like I’m out of luck looking at the food aspect. I’m someone who is not a healthy eater. I am such a picky eater. I need to take supplements on account of my diet is horrendous but there are so many supplements out there that I have no idea which one would be most beneficial. I also don’t get the right amount of sleep. As you can tell I’m not looking so good with keeping my hormones balanced naturally. Well, we all have to start somewhere. 🙂 I’d just suggest focusing on one major change at a time – when clients need a total overhaul, I often have them start on a high quality multivitamin right away, then begin tackling one meal per week. You could focus on simple ways to make your breakfast healthier one week, then make changes to lunch the next week, and so on until you’ve made sustainable improvements to each aspect of your diet. And it really can help to work with a practitioner who can partner with you to create a realistic plan and then hold you accountable to it! Best wishes to you, Kirsten! Thanks for these great tips, loved the concept of the post.These tips can be really benefit at time to time. Thanks for sharing/..! Wow, I learned so much reading this! A lot of these tips Inalready incorporate into my lifestyle, but there is definitely room for improvement. Thank you! This is a great post. You packed it full of so much great information and I definitely got some great help from this! Wonderful, Elizabeth – thanks for reading and for sharing your comment. I love all of these suggestions and some are super easy to implement! Thank you for sharing! Great, Danielle – glad you found it helpful! Thanks for these great suggestions. I am actually dealing with this right now. I never realized the solution could be so simple. This is seriously sucjh good advice. I’ve been feeling a little off lately so these tips will really help me out!!! Thank you! This is one informative post! So detailed and with some great tips I know from experience. Really like the fact you gave examples with the tips! My period has been irregular for the past couple of months and all these info are priceless! Glad I found this article! This is really useful information as I often have irregular periods. I’ve heard that taking Magnesium is also good for managing stress and anxiety so I may have to test that out. Yes, Magnesium is one of my favorites for anxiety as well as hormone imbalance! Thank you for providing such a detailed post with ideas and suggestions. While I no longer have to deal with this problem, being 60, I think there as other hormones related to being in menopause, and most of your healthy eating guidelines and lists of foods seem like common sense for people like me. Definitely! Thanks for reading and for your comment. I think while I could easily succeed as most of these steps managing my stress would be the most stressful. Isn’t that ironic. It’s something I’ve been dealing with for a very long and while it has improved it still needs work. So true, Cia – stress management is definitely easier said than done! Keep at it! I’ve been so interested in how diet plays a role in this! These are such great tips!